One of the long-time prominent leaders and theoreticians of the Communists in Russia. He was born in Moscow, and joined the Bolshevik faction of the Russian Social-Democratic Labor Party in 1906. In 1912 he became one of the editors of Pravda. While he had a number of disagreements with Lenin, Lenin still highly valued him. At the time of Lenin’s death in 1924 Bukharin was one of the three most prominent leaders of the Communist Party (along with Stalin and Trotsky). From 1926 to 1929 he played a prominent role in the Executive Committee of the Communist International. In 1934 he became editor of Izvestia, but in 1937 Stalin had him arrested on charges of conspiring with followers of Trotsky (which was almost certainly false). After a show trial, he was executed in 1938. A Russian theologian, idealist philosopher and bourgeois economist who was a “Legal Marxist” in the 1890s. After the 1905-07 abortive revolution in Russia he joined the Constitutional-Democrats the leading bourgeois party in Russia. In 1922 he was exiled abroad on a “Philosophers’ Ship” for his anti-Soviet activities, and continued his hostile propaganda against the Soviet Union from there. “The General Jewish Workers’ Union of Lithuania, Poland, and Russia; founded in 1897, it embraced mainly the Jewish artisans in the western regions of Russia. The Bund joined the Russian Social-Democratic Labor Party at its First Congress in March 1898. At the Second Congress of the R.S.D.L.P. Bund delegates insisted on the recognition of their organization as the sole representative of the Jewish proletariat in Russia. The Congress rejected this organizational nationalism, whereupon the Bund withdrew from the Party. “In 1906, following the Fourth (‘Unity’) Congress, the Bund reaffiliated with the R.S.D.L.P. The Bundists constantly supported the Mensheviks and waged an incessant struggle against the Bolsheviks. Despite its formal affiliation with the R.S.D.L.P., the Bund remained an organization of bourgeois-nationalist character. As opposed to the Bolshevik programmatic demand for the right of nations to self-determination, the Bund put forward the demand for cultural-national autonomy. During the First World War of 1914-18 the Bund took the stand of social-chauvinism. In 1917 the Bund supported the counter-revolutionary Provisional Government and fought on the side of the enemies of the October Socialist Revolution. During the Civil War, prominent Bundists joined forces with the counter-revolution. At the same time, a turn began among the rank and file in favor of support to the Soviet Government. When the victory of the dictatorship of the proletariat over the internal counter-revolution and foreign intervention became apparent, the Bund declared its abandonment of the struggle against the Soviet system. In March 1921, the Bund dissolved itself and part of the membership joined the Russian Communist Party (Bolsheviks) as new members.” —Note 97, LCW 5:551-552. “Immediately arrest Kogan, a member of the Kursk Central Purchasing Board, for refusing to help 120 starving workers from Moscow and sending them away empty-handed. This to be published in the newspapers and by leaflet, so that all employees of the central purchasing boards and food organizations should know that formal and bureaucratic attitudes to work and incapacity to help starving workers will earn severe reprisals, up to and including shooting.” —Lenin, Telegram to the Kursk Extraordinary Commission (Jan. 6, 1919), during the civil war and famine; LCW 36:499. The policy of class-collaboration which the Social Democratic Party of Germany (SPD) came to with the German bourgeoisie during World War I. “Burgfrieden—literally ‘fortress peace’ or ‘castle peace’ but more accurately ‘party truce’—is a German term used for the political truce the Social Democratic Party of Germany and the other political parties agreed to during World War I. The trade unions refrained from striking, the SPD voted for war credits in the Reichstag and the parties agreed not to criticize the government and its war. There were several reasons for the Burgfrieden politics: the Social Democrats believed it was their patriotic duty to support the government in war; they were afraid of government repression should they protest against the war; they feared living under an autocratic Russian Czar more than the German constitutional monarchy and its Kaiser; and they hoped to achieve political reforms after the war, including the abrogation of the inequitable three-class voting system, by cooperating with the government. “The only SPD member of parliament to vote against war credits in the second session was Karl Liebknecht. In the third session on March 20, 1915, Otto Rühle joined him. Over the course of the war the number of SPD politicians opposed to the war steadily increased. Their resistance against the Burgfrieden politics led to the expulsion of Liebknecht, Rosa Luxemburg, Clara Zetkin, and others from the SPD. These went on to found the Spartacus League, the Independent Social Democratic Party of Germany (USPD), and the Communist Party of Germany (KPD). “The only trade union to refuse the Burgfrieden was the Free Association of German Trade Unions (FVdG), which would later become the Free Workers’ Union of Germany (FAUD).” —Wikipedia article “Burgfrieden” [as of 7/6/11]. 1. A medieval European merchant or prosperous citizen. 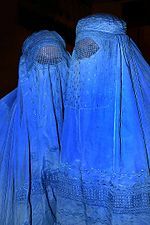 A grotesque tent-like garment, often black, that women are required to wear while in public in some terribly backward religious-dominated societies, which cover every single inch of their bodies and also totally hide every aspect of their bodily form. Even their eyes are often covered by a gauze panel which only allows them to sort of peek through to see where they are going. This garment is rather like a portable prison cell which severely restricts the woman’s ability to interact with her surroundings. Why are such absurd garments demanded of women? Apparently women in these societies are viewed by men as sexual property, not equal human beings, and it is felt that other men in such societies cannot be trusted to treat women properly and with respect if they can actually see them. Obviously societies like this are in desperate need of social revolution. Alternate name for what Marx called the Industrial Cycle. “Thus I helped make Mexico and especially Tampico safe for American oil interests in 1914. I helped make Haiti and Cuba a decent place for the National City Bank boys to collect revenues in.... I helped purify Nicaragua for the international banking house of Brown Brothers in 1909-1912. I brought light to the Dominican Republic for American sugar interests in 1916. I helped make Honduras ‘right’ for American fruit companies in 1905. In China in 1927 I helped see to it that Standard Oil went its way unmolested. “During those years I had, as the boys in the back room would say, a swell racket. I was rewarded with honors, medals, promotion. Looking back on it, I feel I might have given Al Capone a few hints. The best he could do was to operate his racket in three city districts. We Marines operated on three continents.” —Smedley D. Butler, War Is a Racket (1935), excerpt quoted in Leo Huberman, We, the People: The Drama of America (MR Press: 1960 (1947)), pp. 252-3.